Web Calendar That Gets Everyone On The Same Schedule! Company Calendar is an easy, effective, and inexpensive way to solve scheduling problems. The problem isn't an availability of calendars. There are hundreds of great calendars. The problem is the availability of a group calendar. Company Calendar is designed to be a group calendar. 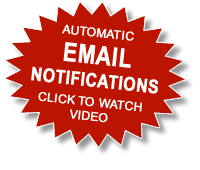 Take a minute of watch the calendar videos. You'll see want we mean. As the Calendar Administrator, your first move is to put all your users in the system. Then you give usernames and passwords to your members. Now you have a group of people interacting with the same calendar as a team. Now you're using a total group approach to scheduling. 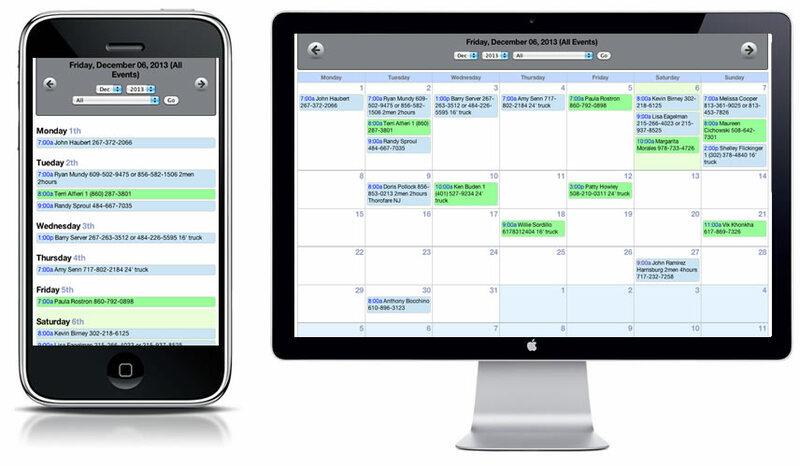 Company Calendar is desktop software that distributes to phones giving you the best of both worlds. Here's what your Calendar looks like on the phone and the desktop. Simpler is better. You will never have "synchronization" issues because everyone uses the same calendar all the time. So you, as the administrator of an organization, can sit in the office and work the calendar on the right on your desktop. Your people in the field will see the schedule on the left on their phones. It's exactly the same calendar. Company Calendar is a bulletproof way to organize a lot of people onto a single master schedule. The best part is you can have 30 users on your calendar for just $15/month. That's $15 a month for everyone! Personal calendars work great for organizing one person. But what about your group? Everyone is tuned into what THEY are doing, but individual schedules don't build cohesiveness between group members. Wouldn't it be great to have everyone in your group all working on the same master schedule? 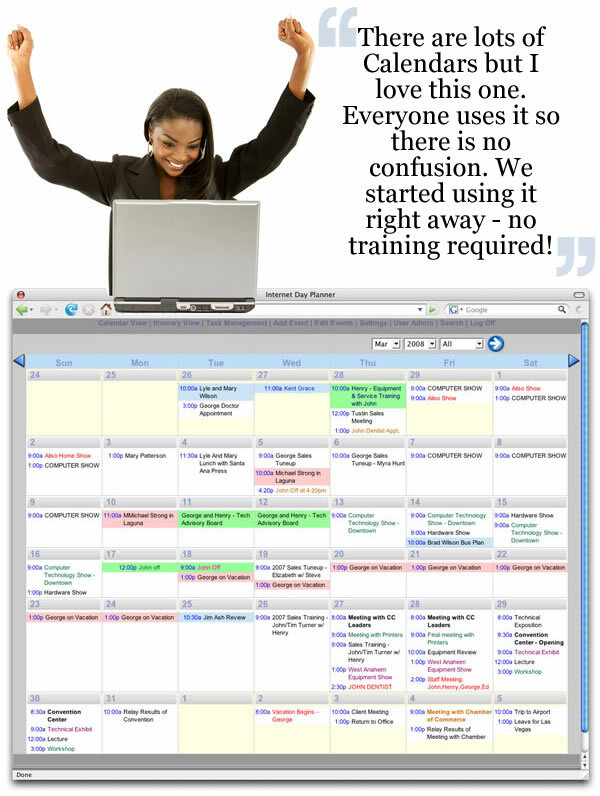 Company Calendar is a simple, comprehensive, web based way to get everyone on the same schedule. Company Calendar is built from the ground up to be a group calendar. Imagine how nice it would be to have one comprehensive schedule for your entire group. If you want to see Company Calendar work, click the Video Tab on the upper right. Simple is better. Look at this screen above. Isn't this what you want to see? It's your company events on a calendar. It's amazing what can happen when you do things the right way. Company Calendar eliminates confusion, running around, missed appointments, and wasting time. How can you get along without it? Get everyone working together. Company Calendar is what cloud computing is about: using it to YOUR advantage to accomplish what YOU are trying to do. Are you having trouble getting your arms around your organization? Get them marching to the same tune. The first 30 days are free. Once you use it, your organizational problems will be over. © 2013 Internet Man Incorporated. All Rights Reserved. Internet Man® is a registered trademark of Internet Man Incorporated.